The Model 7210DIF is a four channel, medium input impedance, low-noise, AC-coupled voltage preamplifier which offers a true differential input. It has a frequency response from 0.1 Hz to 100 kHz and gain setting of x100 with x1, ×10, and ×1000 available. It is a general purpose preamplifier which has the facility to be connected to grounded sources in a manner which breaks ground loops and since it has a true differential input it can be used to measure floating sources, such as the output from an AC bridge, without imposing an asymmetrical load onto the source. It can be powered from an external low voltage supply (±15 V) or from the model PS0110-MD remote line power supply. This preamplifier can also be powered from most of our range of lock-in amplifiers. 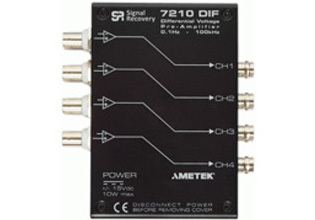 The unit is especially suited to providing differential inputs on the SIGNAL RECOVERY model 7210 multichannel lock-in amplifier. In this case up to eight model 7210DIF amplifiers can be positioned side by side, with the four outputs on each preamplifier connected directly to the 7210’s inputs through the use of male-male BNC adaptors. It can also be used as a standalone and cost effective preamplifier with other single or multichannel instruments, such as oscilloscopes, digitizers, or transient recorders. All signal input and output connections are made using industry-standard BNC connectors.